Posted September 10, 2014 by Kelly McEvitt . The image will be the first thing that people notice. Posts with images perform better than posts without or posts with link thumbnails. Make sure that the image is relevant to the post text. Keep in mind that lifestyle images tend to see more engagement, since they resemble posts from a user’s friends. Next your audience will likely be drawn to your post text. Keep your copy short, usually 100 to 250 characters is ideal. Include a call-to-action if you want your fans to do something, but work it into your rich text. Then include your link at the end of the post. You want the link to be easily discoverable and not overwhelming. Many people prefer to use a shortened link as it’s easier on the eyes. If your post is successful, you’ll notice the amount of engagement received. Take time to analyze your post performance and make adjustments to your strategy to recreate successful Facebook posts. Facebook Page Insights can help you better understand what is working. Does the post have a goal? Ask yourself what you are trying to accomplish with the post. Whether you are trying to drive traffic to your site, get fans to engage with your brand or watch a video, your post should have a focus. Evaluate your content and adjust as necessary. Did you include a call-to-action? If you want your fans to take an action, ask them to! Great examples include Click Here, Register Now, Like, Get Started. Include an action word and encourage your audience to do something. Facebook marketing works because you don’t have to shout your message. Think about your personal Facebook newsfeed; the best content from brands are posts that blend in with content from your friends. Make your content clear, but subtle. Nobody wants to read Facebook posts that resemble novels. 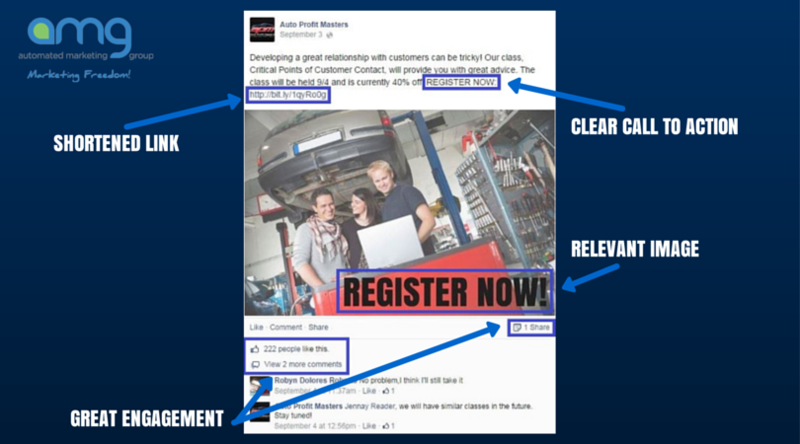 If your content takes a lot of explanation, give a teaser on Facebook and then link to the full details on your site. Your Facebook posts should be relatively short and simple to comprehend. Let’s say you have 500,000 Facebook fans and your average post reach is 16%. That’s 80,000 people who have the potential to see your Facebook posts. Think about your demographic and the potential number of people who will see your content. If you expect your content to have a bigger negative response than positive, you might want to reconsider posting it. If you’re still looking for help with your social media, contact us for a free marketing assessment. Or visit us on Facebook and Twitter!